This episode: Supercritical carbon dioxide and bacteria that can grow in it make a great combination for biofuel production! This episode: Purple phototrophic bacteria could use certain kinds of wastewater, along with electric current, to produce valuable products like hydrogen without much waste! 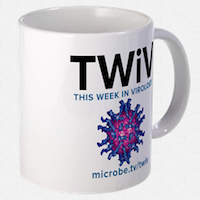 This episode: A new giant virus infecting marine algae brings its own genes related to fermentation, generating energy in the absence of oxygen! This episode: Engineering yeast to control their metabolism using light and dark for the production of advanced biofuels and chemicals! This episode: A version of the microbial enzyme that fixes nitrogen can also convert carbon dioxide to methane! This episode: I talk with Dr. Walter Sandoval-Espinola, a researcher from Paraguay, now a postdoc at Harvard, about his discovery that biofuel-producing bacteria Clostridium beijerinckii can also transform CO2 and carbon monoxide into biofuels! Adding exotic elements to convert spore-forming bacteria into light-capturing cyborgs that convert carbon dioxide into useful chemicals! This episode: Clostridium bacteria that infect potatoes can both kill competitors and tolerate oxygen, thanks to the pink compounds they produce!